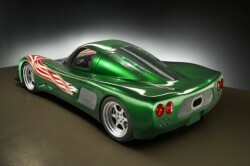 Maintaining the crown as the world’s fastest street-legal car, the Maxximus LNG 2000, the brainchild of financier Bruce McMahan and Indianapolis-based designer Marlon Kirby, has now set world records for both LNG (liquefied natural gas) and LPG (propane). By utilizing proprietary technology, the Maxximus team say they have revolutionized the next generation of green vehicles that provides “legendary” versatility for using both natural fuels and reducing our dependence on foreign fuel sources. The Maxximus LNG 2000 achieved both records at the South Georgia Motorsports Park, with LNG records broken in January and LPG records broken in march. The table below displays the results. Note the outstanding 0 – 60 mph (0 – 97 kph) in just 1.96 seconds. The car can run on LNG, CNG and LPG with on demand adjustments. “Natural gas is a lot more attractive given the situation in the market, and there isn’t a car on the market that currently utilizes both LNG and propane. It’s the ultimate win-win for everybody,” commented Kirby. In addition, Centaur is also developing a consumer-targeted line of vehicles called the Centaur Dragonfly that can be powered by four fuel types — gasoline, LNG, LPG and CNG (compressed natural gas).